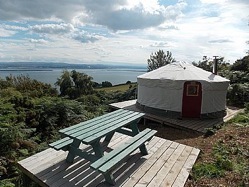 Black Isle Yurts in the Highlands of Scotland offer glamping holidays with a difference on an exclusive, eco-sensitive wild-glamping site that will draw you closer to some of Scotland’s most stunning coastal scenery, just 30 minutes north east of Inverness. 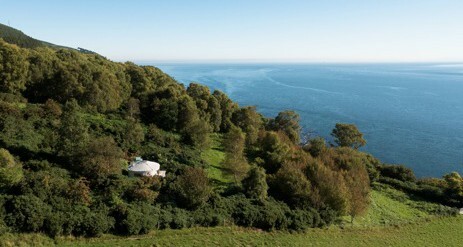 Spend a few nights in a self catering yurt, amongst ancient cliff top woodland with some of the finest views on the East Coast of the Scottish Highlands. 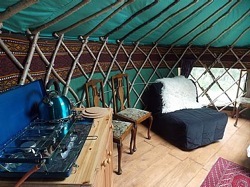 Made from canvas on wooden frames, each are equipped with a solid-­fuel stove, and are snug in all weathers. 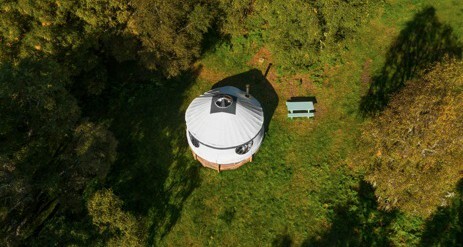 Your accommodation will be in our own hand-crafted yurts which are individually sited within an attractive woodland setting to provide you with unrivalled levels of privacy and tranquillity. 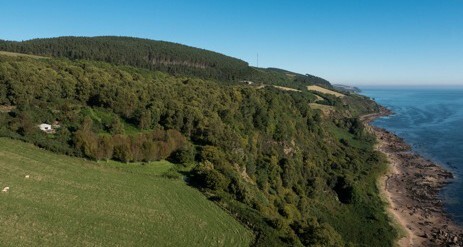 This is an area of great bio-diversity with ancient birch and scots pine wooded ravines and open hill land on which we run a working farm. 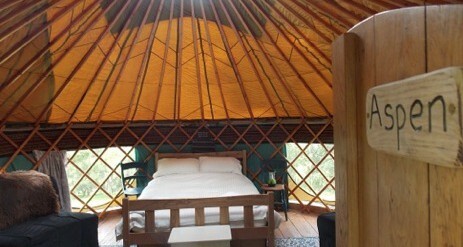 The yurts sleep between 2 and 5 people in comfortable beds that come with duvets, pillows and towels. All cooking equipment, cutlery and crockery are provided ready for self-­‐catering. 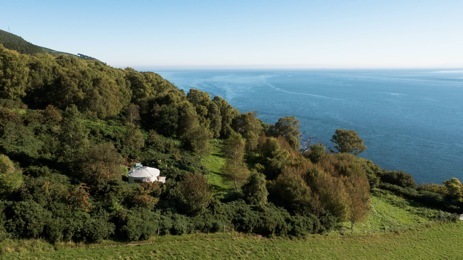 The location of Black Isle Yurts allows spectacular cliff top views, as well as direct access to a dramatic coastline dotted with caves and secluded sandy beaches. 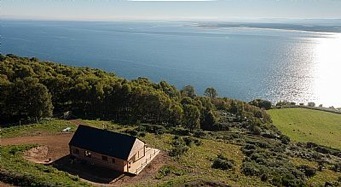 Nearby Chanonry Point is one of the best onshore dolphin-spotting sites in Europe. And the Black Isle is one of the driest, sunniest parts of Scotland, famed for its micro-climate and, thankfully, its relative lack of midges! 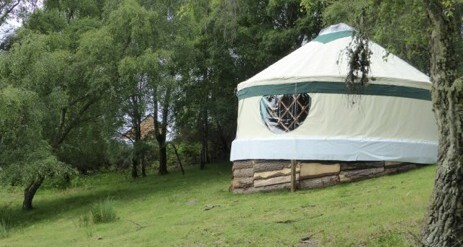 As the yurts are off-grid, they are free from mains power and water supply. Instead, we provide solar/hand powered lighting units and a refillable container of water. For those who prefer it, bottled mineral water is available for sale at The Hub. 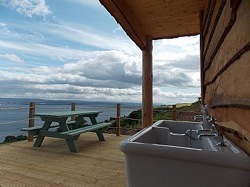 Well equipped shower, toilet and washing up facilities are located a few minutes walk from your yurt at The Hub, from where you can also enjoy breath-taking views of the Moray Firth. 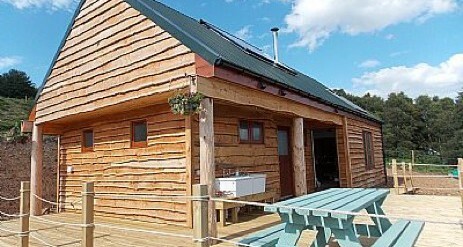 The Hub, which also serves as Black Isle Yurts’ reception, linen storage and office area, is found just below our carpark. Here, if required, we will provide you with a wheelbarrow to assist you in transporting your luggage from the car to your yurt! A free wifi connection is available at The Hub. Horse-riding/pony-trekking at Broomhill Riding Centre, Fortrose. Paintball, Laser-strike and Archery at Wildwoodz, Munlochy (premiere outdoor gaming venue in the Highlands). Golfing at the famous Fortrose And Rosemarkie Golf Club.